Hello, I'm just sending you this message because today I attended your showing of "The Little Mermaid Jr." for a school project I have to do, but I'm completely blown away by how good the play was. You did a wonderful job putting the set and costumes together and the actors were incredible! My friends and I have agreed that Sebastian stole the show and made listening to "Under the Sea" so much better than it should be! I hop you keep putting on these awesome plays and hopefully I'll be able to attend many more! Once again, thank you for bringing this awesome production to fruition. PS: Please let the actors from the 8/20 matinee know that they were all incredible and that we hope to see them again for your Wizard of Oz show! What a spectacular year it has been! Matthew has had the opportunity to learn and improve in every aspect of performance. He enjoys learning the nuances of his character so he can portray the character in a genuine way; he continues to improve his vocal ability and range; in addition, he has learned the exciting choreography and lifts in Showstoppers. Thank you for providing a creative place in which to learn, grow and enjoy! I marvel at the opportunities Matthew has had: Daddy Warbucks in "Annie," Jesus & Carl in "25th Annual Putnam County Spelling Bee," Gaston in "Beauty in the Beast," Charlie Brown in "You're a Good Man Charlie Brown," and Benny in "Rent." Thank you for the support, guidance, and care you have provided. The camaraderie at Showtime is incredible too! The kids support each other and truly root each other on! Thank you from the bottom of my heart for providing such an incredibly wonderful experience for us! I wanted to thank you in writing for everything that SHOWTIME Performing Arts has done for my family. My children love to be at SHOWTIME. In fact, my son has literally has said to me on more than one occasion "How did I live before SHOWTIME?" You and your talented staff, have taken this gem of a kid, and polished him with your expertise and direction. He is now someone that many people believe is the real deal, and he may actually make it in this horribly competitive field, because of the skills you and your staff developed here. We have had so much fun here Marilyn, and will never forget these days. We have developed wonderful relationships with the kids and parents of SHOWTIME, and have come to think of everyone as family. How lucky we are to have found you! We started at SHOWTIME soon after they opened. I have to say that all 3 of my kids found what they were looking for. The acting classes are awesome, the music programs stimulating and fun. My kids are 14, 12 and 8 and each has made new friends and discovered hidden talents. The teachers and director are great with the kids and they offer so many classes. We wanted to thank SHOWTIME for the many opportunities you provide for your students and especially for my two children, both of which have been students, performers and assistants for over 3 years. After 10 years of dance at a studio in another city, our family decided to look for a place closer to our home where our children could take a variety of dance classes as they had been. Little did we know that signing them up for dance classes at SHOWTIME would open up many other opportunities for them. They were soon auditioning for shows and taking voice, dance and acting lessons. At SHOWTIME our children were encouraged to participate and shown how to reach within themselves and bring out those "actors within". When we saw the performances that the entire cast put forth we knew we had made a great choice for our children! In an age where many kids come home and sit in front of the TV or computer, having them come to SHOWTIME keeps them active and inspired. A few years ago, we had the pleasure of attending a performance at SHOWTIME Theatre. As my children watched wide-eyed as children their ages performed on the state, my daughter turned to me and said "I can do that". Of course, at the time we had no idea if she actually could. Well, with SHOWTIME'S help, she has blossomed into a real star. SHOWTIME has afforded her the opportunity to develop her self-esteem and ability to perform in front of groups, both as an actor and singer. She now considers theater her "thing" and has encouraged her brother to join in on the performances and classes. Showtime fosters and encourages great relationships amongst the performers. The children are all kind to each other and the oldest high schooler encourages the youngest elementary school students. The camaraderie and friendships built at SHOWTIME extends outside of the theater and each child is embraced into the SHOWTIME family. We love SHOWTIME, everybody in it and everything about it!!! Our 16 year old daughter thinks SHOWTIME is her 'home away from home'. She has blossomed forth with an amazing talent in singing, dancing and acting that we did not even know she had!! The directors, staff, fellow actors, choreographers and producer are all devoted, kind and highly professional. We cannot praise SHOWTIME enough for its great efforts and encouragement with all the kids! 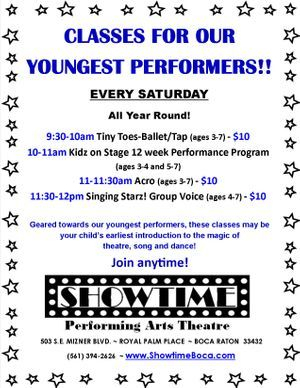 My daughter LOVES SHOWTIME and has really developed her singing and acting skills and their camps/plays are really great. I highly recommend this program. First Rate!